C4B - cable 4 to the back. Slip 2 stitches on a cable needle as if to purl and hold in back of work. 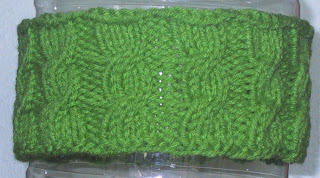 Knit the next two stitches, knit the two stitches off the cable needle. Co 84 , join and work in the round. Rounds 1-5: K4, P2 around. Rounds 6: C4B, P2 around. Rounds 7-10: K4, P2 around. Bind off in K4, P2 pattern. For a 3 inch wide headband work rounds 1-10, and repeat rounds 5-10. This pattern is cool! As are ALL your patterns. YOu are a very talented woman! I really like these! Thank you for sharing. May I ask you a question, if you don't mind. As a new knitter when you were learning to knit, how long did it take to get a good rythm and efficiency? Just wondering. I'm a new knitter, but have been discouraged lately to pick up the needles, because I'm just finding it more difficult than crochet. Stumbled upon your site and this pattern intrigued me. I had never tried cables and this was a good and quick project (I did it for my granddaughter) and the cabling was easy. Thanks! Glad it was easy for you. Good way to practice cables witout much commitment. I made a wider one and use it to hold my hair back while I wash my face.